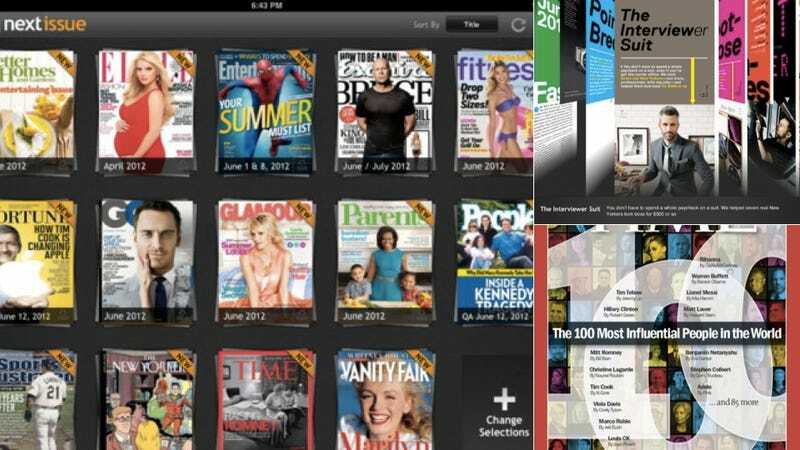 Next Issue, the "Netflix of Magazines," is available today on the iPad. And that has me thinking a lot about the digital magazine format. In general, I love the entire idea of tablet magazines. The touch UI, the ability to carry years worth of issues with me all at once, the instant downloads, the interactive components, and the lack of a paper mountain in my bedroom from old issues that makes me look like some sort of crazy cat woman because I don't want to throw them away. I want this to be the future of magazines. I think. I say "I think" because I have a dirty secret. Aside from a few mags I absolutely have to read the day they arrive, I tend to forget about the other magazines because they're not piling up in my face, filling me with guilt for buying these things and not reading them. And for all the conveniences tablets provide, casually thumbing through a magazine on your iPad still isn't quite as casual as it is with a paper copy. Am I the only one who has an even bigger backlog of magazine reading thanks to the advent of tablets? Anyone else feel a bit overwhelmed by the prospect of Next Issue?